With the release of at-home gel manicure kits, whitening teeth devices and do-it-yourself keratin treatments, it’s getting easier and easier to bring the salon home. And with more autonomy, cheaper long-term costs and, obviously, the ability to stay at home (always a plus), it seems like there’s few downsides to taking a turn as the technician. That is, unless you’re looking for results equivalent to what the same process would get you at the salon. As appealing as the DIY lifestyle can be, there are some treatments that are best left to the professionals—not just for the results, but also for your health. What’s more, according to the professionals at The Drawing Room, a SoHo salon, over-the-counter keratin products can contain varying amounts of formaldehyde. And depending on that unspecified percentage, you may, or may not, get what you pay for. So while our DIY skills may be questionable at best, the lack of results for at-home treatments might not be entirely our fault (we’re glad, but also, that’s not cool). Along the same lines, untrained people using gel nail kits probably shouldn’t expect to replicate the salon effect, said Jen Olson, owner of Spa Soak salon in Chicago. So what’s a DIYer to do? The jury’s still out on how well the new at-home gel nails will go down, but according to Patrick Prinzo, a senior colorist at Warren-Tricomi’s Flatiron salon, some more natural at-home hair treatments can help to scratch the DIY itch. 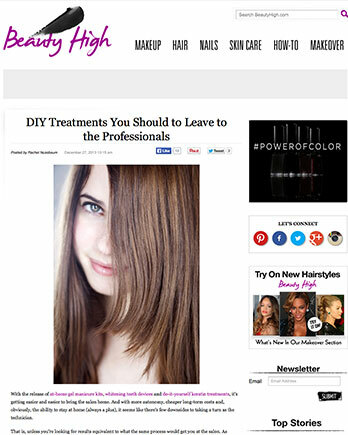 “I would go for a keratin that’s formaldehyde-free, something a little bit more natural. I always tell people at home, go with something that doesn’t have the chemical in it,” said Prinzo. Worst comes to worst, he suggests flat ironing an at-home conditioning treatment into hair for temporary relief.